Every day, Watch This offers staff recommendations inspired by a new movie coming out that week. This week: Hyde Park On The Hudson has us thinking of movies about presidential figures. 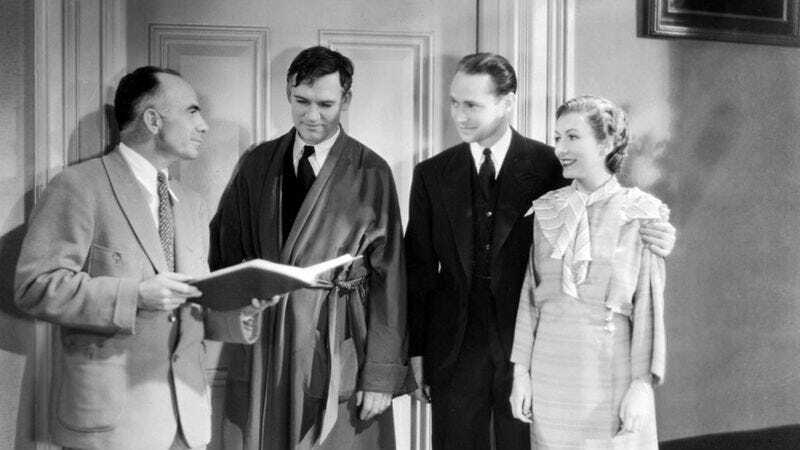 Released the same year that Franklin Delano Roosevelt took office, Gregory La Cava’s Gabriel Over The White House—based on a novel by T.F. Tweed and co-produced by William Randolph Hearst—has baffled viewers ever since with its curious mix of left-wing piety and right-wing law-and-order rhetoric. Walter Huston stars as newly elected president Judson Hammond, a corrupt slacker and product of Warren G. Harding-style cronyism. Then President Hammond gets into a car accident and wakes up from a coma with a fervor to make a real difference. He becomes a champion of the working man, redirecting the angry unemployed toward rebuilding the country on the government’s nickel. Hammond becomes an enemy to crooked men of all stripes, having them removed from positions of power, and in some cases, tried and executed by makeshift military tribunals. Meanwhile, on the global stage the president uses the United States’ military might to persuade the nations of the world to pay off their war debts and sign disarmament agreements. Hammond accomplishes all this by declaring a state of national emergency that allows him to bypass Congress and the courts; and then he dies, having saved the world. Availability: Gabriel Over The White House is available on MOD DVD from Warner Archive.